Early in the semester, the 10 undergraduate and graduate students traveled on a bus, rented by “Dean B.,” to several New Haven neighborhoods like Fair Haven and the Hill. “We push into the neighborhoods beyond the campus, with a tour guide, and meet community members and leaders,” says Brasseaux. The city and its people serve as the inspiration for a collaborative project that is designed and executed by the students. 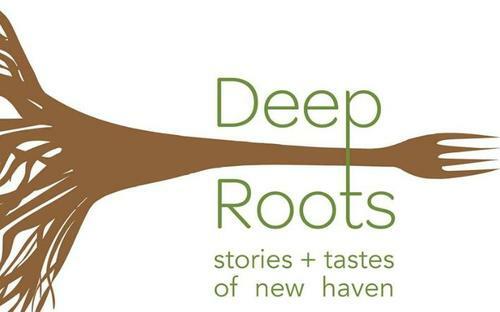 This year, they focused on New Haven’s food culture, for a project called Deep Roots. They interviewed chefs from such quintessential New Haven eateries as soul food restaurant Sandra’s Next Generation on Congress Avenue, Mexican restaurant Cositas Deliciosas on Grand Avenue, and Sanctuary Kitchen, a project of CitySeed, which promotes the culinary traditions of immigrants and refugees through cooking demonstrations, classes, and meals. These stories are featured on a dedicated website, and have been incorporated with recipes for a digital and print cookbook (PDF). The chefs shared their specialty dishes and stories with 35 guests at a sold-out event on Dec. 8 at the New Haven Museum. Past student projects included an immersive documentary about the May Day trials and The Silence Project, an exhibit that featured interviews with young people, immigrants, and parolees, — all groups that can’t vote — that listeners could access via headphones. The collaborative classroom is a natural fit for him, says Brasseaux. When he came to Yale in 2006 to pursue his doctorate in American studies, a public humanities track did not yet exist. But the Louisiana native brought with him a passion for music (he is a former percussionist for the Grammy-winning band the Lost Bayou Ramblers) as well as experience in art exhibitions, public radio, oral histories, and documentary films. He and a fellow graduate student, Monica Martinez ’12 Ph.D., now a public humanities faculty fellow and assistant professor at Brown University, created the Public Humanities at Yale initiative, which became the impetus for a public humanities seminar and, later, an official public humanities master’s track.